Happy New Year and A Give-Away To Start Us Off! This cannot be – I think 1994 was just a couple of years back – who turned up the speed? I finished yesterday with quiet introspection. On a day to day basis it seems as if nothing much happens or changes and life just ticks along. If I want to get maudlin I could say none of my wishes have come to pass. But when I took a moment to step out of the forest in order to see the trees I saw a quite different vista. I see that all my daily needs are easily met. I see that I have all I need and even some of what I want. I see I can meet my expenses every month. I see my friends and family. I see my neighbours. I see I started blogging. I see a community that has grown from that first unremembered step. I see I started painting again. I see I opened an Etsy Shop. I see I wrote 100 posts. I see I had a lot of fun. I see new laughter lines. I see that I love. I see that I am loved. I see a vast landscape of serendipitous meetings, events and inspirations. And I remember to trust that no matter what I think I want, my life is happening even – as John Lennon said – while I am busy making other plans. I see and I remember that I am a most fortunate person! 125 10.5 x 14 cm super shiny postcard sized prints from the good guys over at Vistaprint. I ordered sticky back labels and business cards from them early in December and they arrived the day before we went off on our jaunt through Central Otago to Queenstown. [Click here for that post] I was really happy with the quality and the price. These postcards were an add on at a hugely reduced price and with free postage as a thank you for my order. At the time I thought why not – may as well give it a go – and it is absolutely a WOW! Now lets get on with the business at hand. is a signed print of your choice from my Etsy Shop. If you already ‘Like’ and ‘Follow’ I know – and I love you for it, just leave a comment. If you don’t ‘do’ FaceBook, I absolutely understand, just mention that fact in your comment. If you have stumbled onto this post through my cunning ploy of naming and tagging ‘Give Away’ and ‘Free Stuff’ go check out my Etsy Shop The Contented Crafter for a full list of the prints you could choose from should your name be drawn. 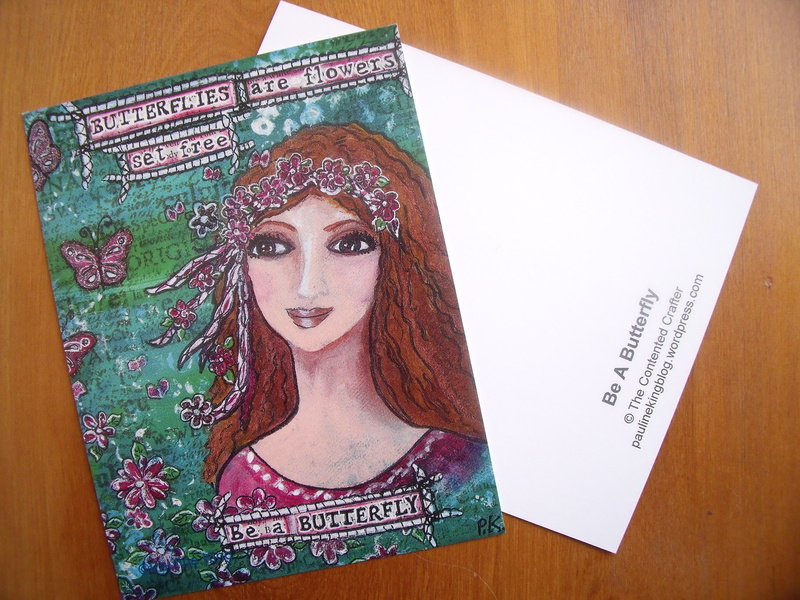 This entry was posted in Creations From My Craft Room, Giveaway and tagged beautiful postcards, Central Otago, Etsy, Etsy Shop, Facebook, Free Stuff, give-away, give-away draw, Happy New Year, Lack of modesty, Life Is Good, Postcard by thecontentedcrafter. Bookmark the permalink. I see that you are a contented, lovely, lady. I have a facebook account, but do not log on often. Oh my goodness I did not realize I get to have my name in the cup! ( I am jumping up and down!!!) Your art is just beautiful + I love your process you use to create such magical works! Oh what a fun post. You are the bees knees my dear. I love your art, your energy, your sharing and caring. I’m tickle to see this lovely art on postcards. 230 blogs is a lot! You don’t actually do any sleeping do you – because you not only read but comment copiously on them – all of them? – surely not!! My mind is boggling!! Ditto ma’am 🙂 Your wonderful comments make my day and seem to come when I am feeling particularly twitchy about things. I don’t comment on all of my RSS Feed Reader blogs. Some of them are purely educational and teach me about organic gardening, permaculture, vegan food etc. but a select core are my favourites and I always comment. You just elevated yourself to that select core and I might even click “follow” (and get the emails) just so you get one step closer to your goal. [Blush, smirk and curtsy] That makes me feel better – I just sent you a message bemoaning the fact that I haven’t got an annual report and basically it’s not fair!! Please tell me where they hide them. No, no – you didn’t sound at all ungrateful and I certainly never meant to imply that you did sound ungrateful – fully got that your interest is with your community of readers!I’m just miffed [a little, fading fast] that I didn’t get one, don’t want yours, want my own! But fully expect to continue with my life completely unaffected by the fact that WP missed me out …. I’m a bit behind with my emails on account of computer idiosyncrasies, but nearly back on track now! Wendy hasn’t got one either Pauline so I am wondering if it is a NZ thing? Discrimination on WordPress!! ??? Surely not! I have inquired, but had no response as yet. Good luck…Wordpress don’t really care about their free bloggers any more and they stopped actively sorting out problems. If you want answers you need to go to the help page and check out the forums. That’s part of the reason why we are going to move Serendipity Farm to a self hosted site ASAP (that, plus we are almost full 😉 ). I’ve liked and followed (and followed on Twitter, too, just in case . . .); now to comment . . .
I’m so happy to see you have covered all the bases Linne – well done! Thank you for the share on FB too – that is so appreciated!! I think we should all sparkle every opportunity we get – perhaps that should be this blogs aim for 2014 – I like the idea!! That’s Laurie teaching us a new fun thing to do! Well caught! It is a terrific list of accomplishments isn’t it – and I only saw it because I caught the thought that nothing much had happened – what rubbish we tell ourselves sometimes!! Good luck dear Boomdee! I am glad you came by to join in the fun! Good luck!